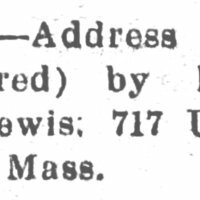 Branford left Birmingham, Alabama, in 1886. 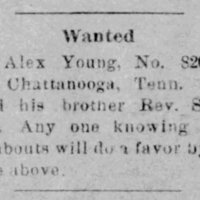 He was last heard from in St. Louis, Missouri, in 1887. 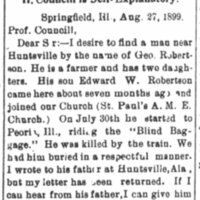 Edward W. Robertson went to Springfield, Illinois, in 1899. He was killed by a train on his way to Peoria, Illinois. Donagan is searching for his father, near Huntsville, Alabama, so he can inform him. 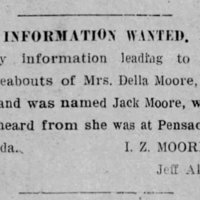 Her husband was Jack Moore. 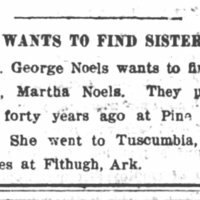 She was at Pensacola, Florida, when last heard from. 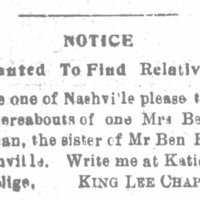 She is the sister of Mr. Ben F Batts of Nashville, Tennessee. 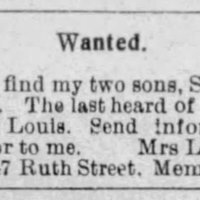 The last heard of them they were in St. Louis, Missouri. 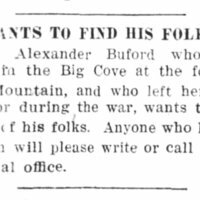 Buford was born in the Big Cove at the foot of Big Mountain [Big Cove, Madison County, AL]. 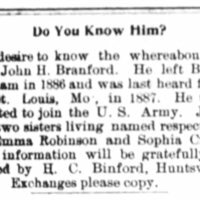 He "left" there before or during the Civil War. 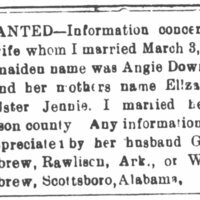 They parted over forty years ago [ca 1868, during the Civil War or Reconstruction], at Pine Bluff, Arkansas.